Luminescence depicts personal and inter-personal energy in the form of light and sound. 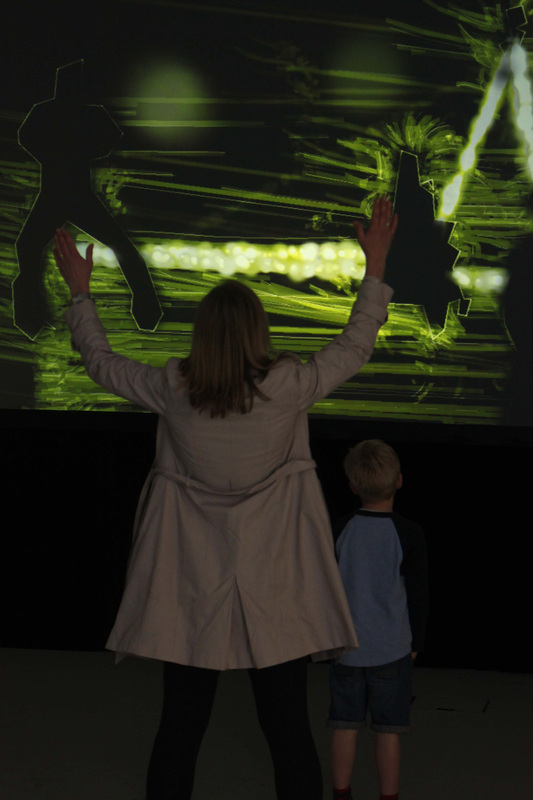 An infra-red Kinect camera tracks the movement of people and objects within a pre-determined ‘active zone’ located in front of a large back-projected screen. To enter the active zone is to become part of the art work. In its passive state, the work cycles through a ghost-like semi-generative soundscape accompanied by ambiguous blobs of colour. As soon as one or more objects or individuals enters the active zone, the installation transforms into its active state. A permutating rhythm track cuts in and a simplified outline is drawn around each participant/object. Swirling, Manga-esque coloured marks emanate from these outlines, the intensity and direction of which follow the range and direction of original movement. Each object/person that enters the active zone is connected by a fluxing ‘energy thread’. The total number of energy threads present influences the sound design leading to a crescendo-type effect when more threads are created. The colour scheme shifts dramatically once a given number of threads is achieved. By dwelling near the edge of the active zone, participants are able to play quite finely with the installation, allowing different parts of the body (eg hands) to become part of the artwork, thus creating multiple threads with one body. This aspect of the installation was very popular when installed at firstsite. The overall result is an audio visually stimulating and extremely exciting experience for participants of all ages and abilities, effectively encouraging playfulness by visually and sonically ‘rewarding’ bodily and inter-personal interaction. First installed at firstsite in April 2014 supported using public funding by Arts Council of England and Essex County Council.